Iowa farmer Kelly Tobin has experimented with cover crops for 10 years in the hopes of increasing the health of his soil. Corn and soybeans make up, incredibly, nearly 40 percent of what’s currently grown in 13 farm country states (Ohio, Michigan, Wisconsin, Minnesota, Indiana, Illinois, Iowa, Kansas, Missouri, North Dakota, South Dakota, Nebraska and Colorado), according to the U.S. Department of Agriculture. So changes are likely to come slowly, if they come at all, and plenty of obstacles remain. To begin with, farmers aren’t going to plant a new crop unless they know they can sell it. Right now, grain elevators, transportation systems and even the markets have all evolved to make selling corn and soybeans relatively easy. That means it’s risky and challenging for commercial-scale farmers to change what they grow on hundreds of acres, even when they think it might be good for their land. In hilly southwest Iowa, the winter terrain is primarily dark soil streaked with the beige remains of last season’s corn. But on some fields a hint of plant life is already visible. “I’m known as, ‘That green farm out east of New Market,’” said Kelly Tobin, who’s been farming in Taylor County since the 1960s. We’re looking out at a field not of corn, but of rye. Tiny shoots are just barely tinting the near-frozen ground with a layer of green. Tobin says he’s counting on this batch of cover crops, plants grown opposite the corn and soybeans, to put down roots that keep soil and nutrients on the fields. He’s also made physical changes on his fields that control the water and prevent it from running off before nutrients have been absorbed into the soil. Despite his eagerness to experiment and improve his land, Tobin illustrates the challenge for any modern farmer: he could plant alfalfa, for instance, on some of his fields to help nurture the soil. But that would mean planting less corn, and likely earning less money, at least in the short term. Years ago, Tobin raised cattle and he laments that he no longer does because they would eat the alfalfa hay. 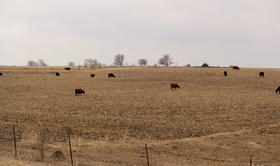 The rolling hills here once housed many more cattle and grew fewer acres of crops, although some farmers still do have cattle that graze on the corn stalks and cobs left on the harvested fields, or on cover crops. Some researchers think integrated systems with varied crops and livestock could benefit the land. 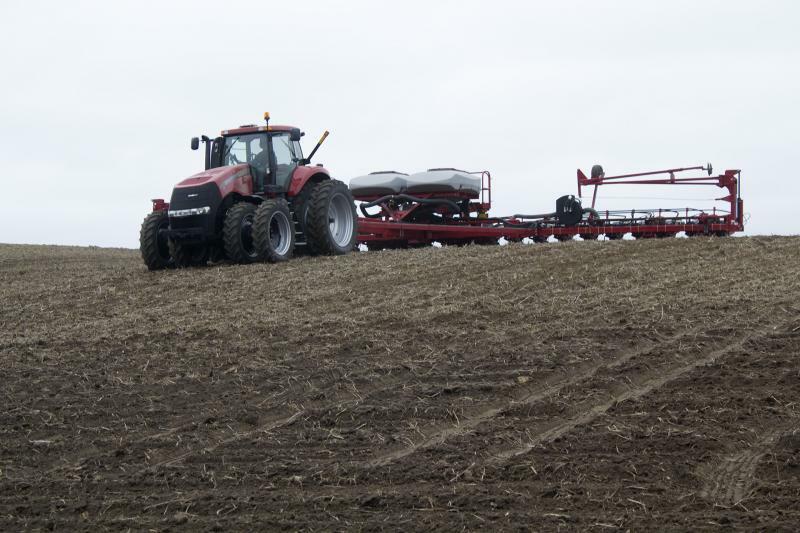 Iowa State University agronomist Matt Liebman’s data suggest that adding alfalfa into a corn-soybean rotation can actually increase future corn yields. But without livestock, farmers have to be more creative to make the economics work. 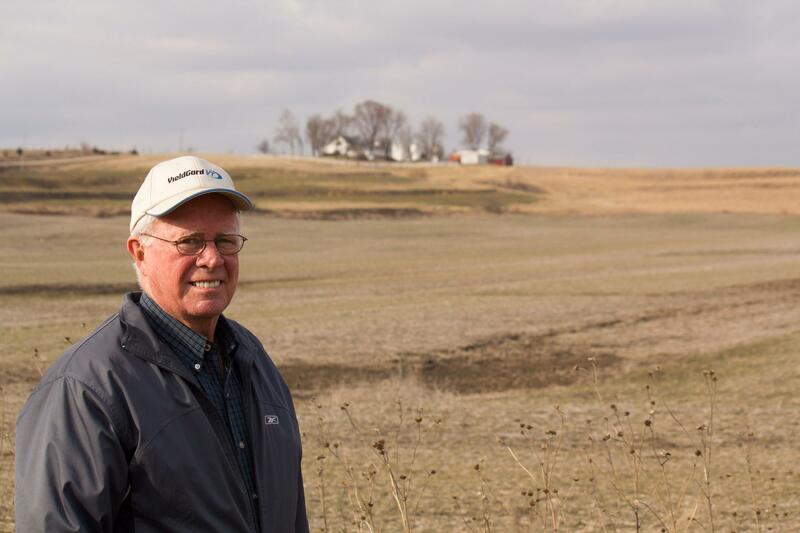 Because the prices for corn and soybeans have dropped in recent years, this might be a good time for farmers to look at growing crops that can help soil or protect water, especially if they could benefit the farm’s overall operation over the long haul. Liebman presented his research to a receptive group of farmers at a recent day-long meeting sponsored by the Taylor County Soil and Water Conservation District. One local farmer in attendance, Ronald Taylor, said he still keeps about 50 cows and grows alfalfa, in addition to corn and soybeans. “I raise alfalfa because I like raising alfalfa,” he said, “I get more joy out of that than raising corn or cattle.” And he could get more benefit from the alfalfa, he learned, perhaps by rotating it with the other crops more frequently. Taylor said he plans also to try clover as a cover crop. 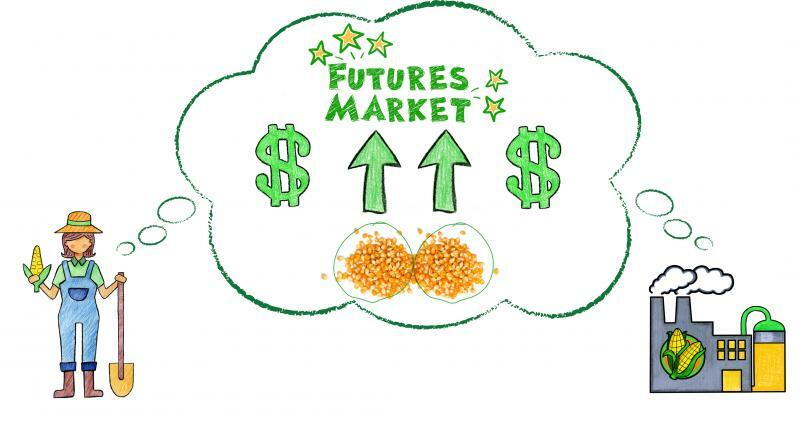 Current market prices for corn and soybeans are making it more palatable to try new things. “It’s a little more ideal time to try something new on some of that highly productive ground,” Taylor said. Despite the challenges, growing alfalfa every few years or putting down a cover crop doesn’t force farmers to move too far out of their existing systems. That adds to the appeal, and the likelihood that farmers will give it a go, but it doesn’t give change much of a jump-start. She knows it’s a tall order. 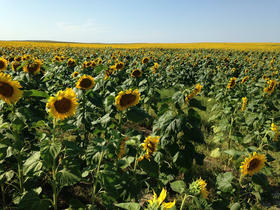 But Wiedenhoeft would like to see more fields growing food for human consumption. 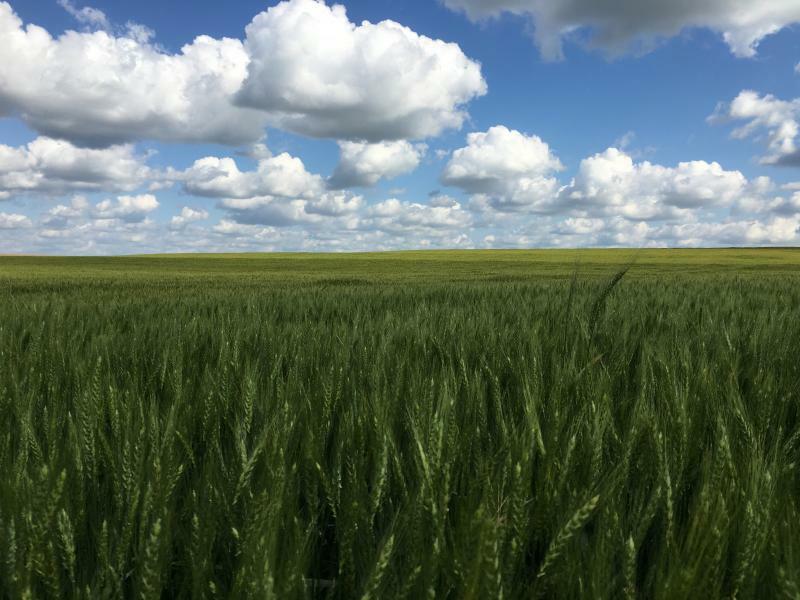 U.S. farmers raise more than two dozen different field crops, including many that feed people as opposed to livestock or cars, but most are small players in the Midwest. Add up all of the acres of canola, sorghum and wheat and you’ll still have less than half of all corn acres, according to USDA data. Wiedenhoeft says there’s plenty of room among the rows and rows of corn and soybeans in Iowa, for instance, to grow other crops, too. Some future summer day, driving through farmland could be a little less monotonous. Change takes time. But with that, sunflower might brighten up the leafy green quilt of Corn Belt farmland with contrasting blocks of bright yellow petals. One in every five calories people around the world eat, comes from just one grain, wheat. And for generations the U.S. led the world in wheat exports. But, that’s changed, and maybe for good. Wheat is not something you want to run out of. Wheat shortages helped spark the bloody French Revolution and the Arab Spring.